Blakiston’s Fish Owls are arguably the largest owls in the world. They are also endangered, with their largest threat being habitat destruction by humans. Don was rescued while still in the egg from parents that were unable to hatch their eggs year after year. She is the first Blakiston’s Fish Owl to be successfully hatched in captivity. She was also used as the model for the only conservation book written on her species. Don (a female) has imprinted on her caregiver, Mr. Sumio Yamamoto, and thus is comfortable around humans. Blakiston’s Fish Owls are exceedingly difficult to see in the wild, and because most visitors are unlikely to see one, Don provides a wonderful opportunity to see one at very close range. Don works as a conservation ambassador for fish owls and the need to protect old forest habitat for the many multinational visitors who visit Hokkaido, Japan every year. Government officials from the Ministry of the Environment visit Mr. Yamamoto to learn about Blakiston’s Fish Owl conservation and Don provides an opportunity for these officials to observe these impressive owls at close range. She has been a foster mother and successfully incubated and raised two Blakiston’s Fish Owl chicks, even though she was not raised by her own species. One of these chicks was later released to the wild and successfully bred in 2012. Don’s 17 year career as a conservation ambassador and research subject make her a worthy recipient of this award. 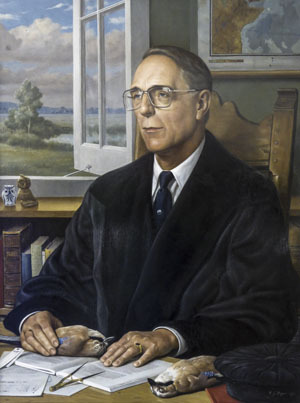 The late Dr. Karel H. Voous (1920-2002) was the leading ornithologists in The Netherlands for about 30 years, as well as one of the worlds’ leading ornithologists. One of his qualities was his ability to bridge the gap between amateur and professional bird researchers. Dr. Voous was among the first professors in The Netherlands to present a series of lectures on nature conservation, plus one series devoted entirely to raptors. His knowledge and enthusiasm attracted many students to the field, to whom he gave lifelong inspiration through his lectures during field trips and bird banding camps, and in the classroom at the Vrije Universiteit (Free University) in Amsterdam. His students went on to publish many important papers on owls. One of the critical issues he addressed was pesticide use at the expense of birds, including owls. He also emphasized that taxonomy should focus on the process of distribution and speciation, rather than just on classification. In his Atlas of European Birds he presented global distribution maps of all species - not yet usual at the time. He also was one of the first to realize that vocalizations could be important in classification of owl species. Dr. Voous authored over 20 scientific and many more popular publications on owls and was a gifted editor and educator. He is perhaps best remembered for his award-winning Owls of the Northern Hemisphere. Dr. Voous called the latter a “work of love” and it wasn’t just another bird handbook. It included 47 owl species accounts including distribution, climatic zones, geographical variation, voice, circadian rhythm, antagonistic behavior, ecological hierarchy, breeding habitat and breeding, food and feeding habits, movements, geographic limits, and life in man’s world. Not to mention Ad Cameron’s beautiful drawings of all species. Champion of Owls Award: Dr. Carl Marti, U.S.A.
“Carl was widely regarded as one of the world's leading authorities on the Barn Owl, having made enormous contributions to our understanding of its ecology," said Sam Zeveloff, chairman of Weber State University’s Department of Zoology. Carl was a member of the Raptor Research Foundation and taught in the Department of Zoology at Weber State University in Ogden, Utah, for 28 years. He was one of the first professors to emphasize the importance of student research, inspiring hundreds of students throughout his career. He collaborated with researchers around the world on owl, hawk and other bird studies. 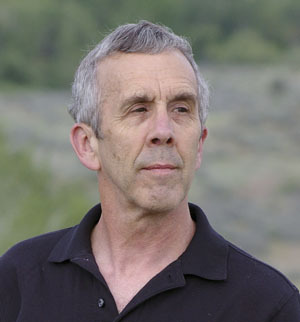 Although Carl authored at least 40 publications on a variety of owl species worldwide, he is best known for his long-term field study of Barn Owls in Utah and in the Morley Nelson Snake River Birds of Prey National Conservation Area in Idaho. The article on his 15-year study of Barn Owl food habits was published in the Wilson Journal of Ornithology only one month before his death. Carl’s research revealed important life history information about the Barn Owl in North America, providing particular insights about Barn Owl reproduction and feeding ecology. Marco Mastrorilli believes that research is necessary in order to protect owls, but it is equally important to teach and inspire the general public about owls so people are willing to invest in conservation. To encourage the general public to appreciate owls, Marco created the Festival dei Gufi (Festival of Owls), now the largest nature festival in Italy. It grew in attendance from 3,000 visitors in 2007 to 25,000 visitors in 2014. Marco also created Notte da Ascoltare (Night to Hear) to help people with sight impairments to learn about owls, taking participants into the field to listen for wild owls. 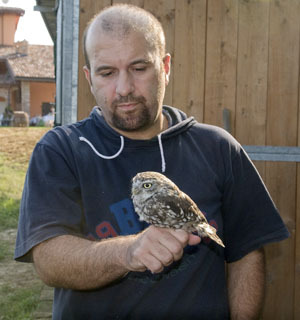 Marco is the founder of the Gruppo Italiano Civette (Italian Owl Group), an organization focused on scientific research and sharing that knowledge. In 2005 he launched a national census of owl habitats. He has been involved in the recovery and rehabilitation of owls and in 2001 launched a project to install owl nest boxes. He has extensively studied many owl species in Italy. Over 25 years Marco has written over 14 books, has published over 450 articles, and has written over 40 scientific papers on owls in Italy and abroad. He also wrote a children’s book, Fantastic World of Owls, and has written about the relationship between fairy tales, animals and storytellers. Special Achievement Award: Sam and Bob Fox and Greg Clark, Arizona, U.S.A.
Bob and Samantha (Sam) Fox are the ‘heart’ behind Wild At Heart, a raptor rehabilitation organization in Arizona founded in 1990. They established the first standardized raptor foster-parenting protocol in Arizona that has since been adopted by other rehabilitation organizations in Arizona and other states. Several species of foster owls care for over 100 nestlings each year. From Wild at Heart’s conception, they have followed a habitat-oriented program by releasing rehabilitated and rescued owls into appropriate and enhanced habitat. Their biggest conservation achievement is their Burrowing Owl relocation programs. In 1993, Wild At Heart (WAH), began constructing the first artificial underground burrows in Arizona and relocating rehabilitated Burrowing Owls into these new homes. This prototype program was conceived by the Foxes in 1993, and expanded in 2001 with the addition of Greg Clark Wild At Heart’s Habitat Coordinator. Over the years, the Burrowing Owl Project became the largest program ever attempted to rescue Burrowing Owls at risk from development and to relocate them to artificial burrow habitat. Thousands of burrows have been constructed throughout Arizona by Wild At Heart and community volunteers, and hundreds of Burrowing Owls have been trapped and relocated. The Burrowing Owl relocation protocol Wild At Heart developed was so successful that the U.S. Fish and Wildlife Service made it a requirement for Burrowing Owl relocation permits in Arizona. 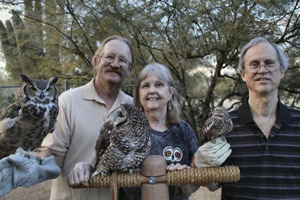 Due to their extensive experience working with owls in captivity, the Arizona Game and Fish Department approached Bob and Sam in 2006 to develop and manage a captive breeding program for the endangered Cactus Ferruginous Pygmy Owl. It was considered challenging to breed in captivity since it only breeds in saguaro cacti. Females select their mates in the wild, but in captivity mates are selected for them by best DNA matches. If not to their liking, the females will kill the “selected” mate. Subsequently Wild At Heart became the first facility to successfully breed this species in captivity with a complicated system of aviaries, flyways, humidity controlled chambers, and remote monitoring. In addition to their research, rehabilitation, and conservation efforts, their education programs touch the hearts of tens of thousands of people every year, and have included working with television programs and film producers.